Originally published on July 27, 2014. * This was partly written immediately following those games, but fell by the wayside until now, so here it is. Used under Creative Commons license (http://creativecommons.org/licenses/by-sa/3.0/deed.en), taken by “DX Broadrec”. Baseball Pedigree: Has hosted baseball since it opened in 1988, home of the Yomiuri Giants, hosted WBC games in 2006, 2009 and 2013, hosted MLB season-opener games in 2000, 2004, 2008 and 2012. 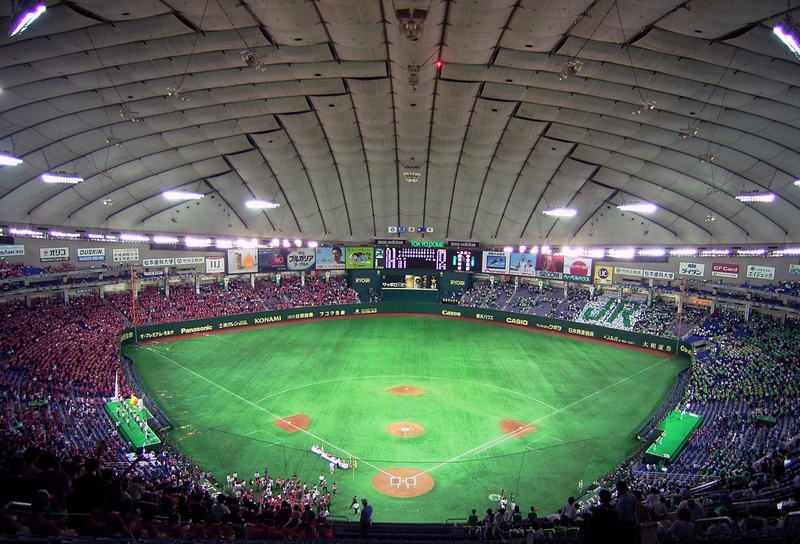 Japan is one of the preeminent baseball nations on Earth and host to the world’s 2nd most prominent baseball league. Pros: Japan is baseball-mad, has shown it can pack the stadium for MLB games, and the Tokyo Dome is highly-familiar to MLB officials and some players thanks to it’s many previous MLB-related events. Being a dome makes weather considerations non-existent, and Tokyo’s status as one of the world’s greatest cities allows for plenty for players to do when not playing. Cons: It’s been done before several times, it’s a type of stadium that has been phased out of MLB, and, while this isn’t much of a factor that MLB cares about much, there is the time difference issue, with night games in Tokyo being early morning games in the Eastern USA and very, very, very early morning games in the western part of the USA. Likelihood of return: It’s inevitable that MLB will return to Japan again sometime in the future, the question is whether the Tokyo Dome is the place it will happen. More-than-likely yes, but I’ll be looking at other possible Japanese sites later on. Baseball Pedigree: Has hosted baseball since 1964, including MLB stints in 2001, 2003 and 2004 (during the final years of the Montreal Expos) and 2010 (when the Marlins had a series there). Has also hosted games in all three WBCs. Puerto Rico has a long and storied baseball tradition, although it has fallen on hard times in the years since it was folded into the auspices of the MLB Draft. Pros: Is a stadium that MLB officials and groundskeepers are highly-familiar with. Puerto Rico’s status as a Commonwealth of the United States cuts down on a lot of bureaucratic red tape. Games in Puerto Rico could help provide a good jolt to Puerto Rican baseball. Time Zone difference is little-to-none and travel distance is also minimal. Cons: San Juan, like Tokyo, has been done plenty of times before. In addition, Estadio Hiram Bithron is small by MLB standards. Likelihood of return: It’s almost guaranteed that Hiram Bithorn Stadium will see some sort of MLB-related action again (WBCs, exhibitions, perhaps mid-season games similar to what Montreal and the Marlins did), but I find it unlikely that they would use it for a big “Opening Series” again any time soon. Photo by Pedro Zurita Zaragoz. Used under Creative Commons (http://creativecommons.org/licenses/by-sa/3.0/deed.en). 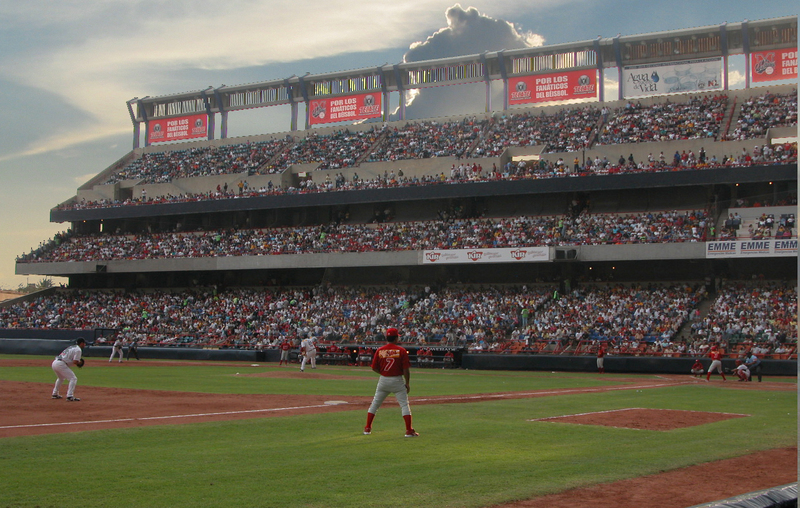 Baseball Pedigree: The largest baseball stadium in Mexico, built in 1990. Hosted MLB games in 1996 and 1999. Was considered a long-shot possibility for acquiring the Expos in the 2000s. Mexico is, of course, a long-time power in baseball and home of at least two professional leagues. Pros: Big stadium in what is anecdotally said to be the best “Baseball Town” in Mexico that hasn’t been visited by MLB since the 1990s and never has hosted a WBC either. Time Zone and travel distance is minimal. Cons: Monterrey isn’t as eye-popping of a location as places like Tokyo or Sydney, and playing in Mexico isn’t exactly charting a brave new world for MLB either. In addition, the Mexican Drug War, while unlikely to be a problem for the games themselves, may make MLB weary. Likelihood of Return: Maybe. There’s no real reason why they can’t, but there’s really no big reason why they should make it a super-duper-priority either. Baseball Pedigree: Hosted White Sox/Giants world tour in 1914, hosted “Opening Series” in 2014. Australia is a growing source of baseball talent and possesses a professional league, but the sport is mostly an afterthought for most Australians. Pros: The atmosphere of playing in the SCG was neat, like playing a game in Churchill Downs. Australia is, as mentioned, a growing source of baseball talent. Both regular season games were near-sellouts and the general reaction to them from Australians was positive. Sydney is one of the world’s great cities and provides plenty of things for players and coaches to do when not playing or practicing. Cons: It’s unknown whether a return trip to Sydney would have the same effect as the first, since it won’t have the novelty of being the first time. Very long plane trip and big time difference. Likelihood of return: High. It’s already been said that there are some discussions of a return to Oz, and although it’s possible it could be elsewhere in Australia (there are, after all, plenty of other Cricket Grounds in Australia), it’s likely that Sydney would have right-of-first-refusal for the games. Baseball Pedigree: Home of the Montreal Expos from 1977 to 2004. Has hosted exhibition games featuring the Blue Jays and Mets just before Opening Day of 2014. Canada is the only nation other than the USA with an MLB franchise, a increasing source of MLB talent, and Montreal was actually a pretty good baseball town until the 1994 strike. Pros: Was actually used for Major League Baseball for decades, would have zero time differences and minimal travel. Would throw a bone to a city who’s baseball fandom was destroyed by bad ownership and the 1994 strike. Cons: Olympic Stadium is still a dump, Canada has games every season for 81 days. Likelihood of return: Highly doubtful for the “opening series”, but it wouldn’t be shocking if the Blue Jays eventually play some home games there during the regular season, sort of like the exhibition games they played. Baseball Pedigree: Under construction, once finished the Seoul Dome (technically called the “New Seoul Ballpark” or possibly the “Seoul Gocheck Dome”) will be the first domed baseball stadium in Korea. Baseball, as you know, is one of the most popular sports in Korea and the Korean Baseball Organization’s championship is one of the most talented leagues in the world and behind only Japan’s NPB in Asian baseball. Pros: Regular season games in Seoul would bring regular season MLB to a traditional baseball country that has never had it and highlight one of the world’s great cities. The advantage of having a dome is that it would eliminate the chance of a rainout, which MLB would most definitely want to avoid, given the fact it’d be impossible to make up overseas, no doubt angering the many who had bought tickets to the game. Cons: The usual time-zone issues apply, of course (not like anybody cares), but there is also the problem that a lot of KBO teams apparently for awhile wanted nothing to do with the new stadium, due to it’s location, lack of accessibility, and small size (two of Seoul’s three KBO teams play in Jamsil Stadium, which has more seats than the 22,000 seats that will usually be available in the dome). Would MLB share those concerns? I don’t know. In addition, the Korean peninsula isn’t the most stable place, geopolitically, so it’s possible that the sometimes-overly-cautious MLB owners would be weary of having games there. Likelihood: It’s somewhat surprising that MLB hasn’t gone to Korea yet, so you have to think it’s somewhere down the line, either at the new Seoul Dome or one of the larger outdoor stadiums. Baseball Pedigree: Taiwan has a long storied tradition with baseball, including many Little League titles and appearances in three WBCs, hosting games during one of them. Pros: There have never been regular season games on the Island Formerly Known As Formosa (much like Istanbul, Taiwan has a lot of names), so it would be breaking more ground. In addition, it would help Taiwanese baseball get some good attention, as it still is dealing with after effects of a gambling scandal, of which they have a love history. The new dome, currently under construction, would be immune from rain-outs, as well, definitely a good point. Cons: Taiwan isn’t as big a market people-wise as some other possible places (South Korea’s population is twice as big, for example), the usual worries about time-zones and travel time. In addition, the gambling thing may scare off some MLB suits, although the odds that they could have an effect on a game played by multi-millionaires is low to nil. Likelihood: It seems likely that the Taipei Dome will host some sort of MLB event once it is opened, but it could just as easily be a WBC round or MLB post-season exhibition tour. Baseball Pedigree: The Netherlands has arguably the greatest European legacy in baseball, especially when one considers the role of players from the Caribbean portions of the Kingdom, such as Curacao. They call it “Honkbal” there, have a professional league, and were able to make the semi-finals of the last WBC. Pros: This stadium, opened just this year, was specifically built to attract MLB and had it’s standards in mind. Games in the Netherlands would provide an opportunity to try and break into European markets and would reward one of that continent’s best baseball programs. Cons: Much of the Netherlands’ baseball tradition and following is rooted in the Caribbean, and in Holland itself it is merely a niche sport. “Hoofddorp” doesn’t have the same marketing ring for the first European adventure as “London”, “Barcelona”, “Rome” or “Berlin” does. Another con is the weather, as the stadium lacks a roof. Likelihood: Likely to host some sort of MLB event at some point in the future, but it’s less likely (but certainly still very possible) that they’ll be hosting regular season games. By one recent account, London is the leading candidate for the first MLB regular season series in Europe. There are many advantages to London: it’s a familiar place, speaks a familiar language, has been the site to NFL and NBA events in the past, and not entirely without baseball pedigree (albeit not much anytime in the recent past). There are likely two possible sites that MLB will consider for games in London: The Oval and Lord’s. Both are cricket facilities that hold over 20,000 spectators (The Oval holding about 23,500 while Lord’s holds 28,000). While there are, of course, larger venues in London such as Wembley, the cricket stadiums would definitely be the ones best suited for baseball, although I guess MLB could try to make a LA Coliseum-style diamond at Wembley, with a large net in left field to stop cheap homers. Besides the lower-capacity stadiums in London compared to some other places, the main things going against London are lack of baseball tradition and the weather. Especially the weather. Assuming that MLB would have a season-starting series there in March, they need to remember that this is London, (infamous) for it’s rain and fog. And, well, there is no roof to hide behind. On the other hand, we’d be able to see the NY Yankees (who almost certainly would be the first choice to send to England, as they probably are one of the few MLB teams anybody there can name) get covered by British Tabloids. And that’s be hilarious. If there is one place that MLB would love to have regular season games, it’d be mainland China, home of 1.35 billion potential customers and an economic superpower. However, that’s unlikely anytime soon, partly because there are no big baseball stadiums there (the one built for the 2008 Olympics was taken down not long after the games, and the remaining ones are nowhere near big or advanced enough), partly because there are no easily baseballized stadiums there (there isn’t exactly a Chinese tradition in cricket), and partly because it would probably involve a lot of red tape. In Japan, should MLB want to spread out regular season openers some more, there are plenty of possibilities. While the various domed stadiums are the most likely since MLB wouldn’t have to deal with rain worries, that’s a bit of a bummer, as it takes away some of the best stadiums in Japan. For example, it’d be cool to see MLB players have a series at Koshien, the oldest and most hallowed of Japanese ballparks and site of the National High School Baseball Championship tournament, Japan’s most followed sporting event (it’d also be neat just to see MLB baseball on an all-dirt field, but it’s likely that that alone disqualifies it from ever happening). It would also be cool if there was a game at Hiroshima’s relatively new stadium, which is arguably the closest Japan comes to a “retro” MLB stadium like Camden Yards or PETCO Park. If you want to go beyond Japan, Korea and Taiwan, the best (or at least most historic) baseball stadium in Asia is likely in the Philippines, at Rizal Memorial Baseball Stadium. Holding 10,000+ people and once the site of exhibitions by Babe Ruth and Lou Gehrig, it’s unlikely to host MLB games for various reasons, but especially because it looks like it is in need of major renovations to be anywhere near the standards required for a MLB regular season contest. Cricket is a major sport on the Indian Subcontinent, but Million-Dollar Arm or not, I don’t think you’ll see an MLB game in or around India anytime soon. Small but possibly up-to-standards ballparks in the Pacific such as those in Guam and the Marianas are unlikely due to their small size and low populations. They, put simply, just aren’t where the money is. The Dominican Republic would, of course, make a ton of sense, but ironically the fact it is baseball-mad may actually work against it, especially since the stadiums there aren’t huge and the economy is not as big as other possible baseball-mad (and baseball-newbie) locations. Venezuela is similar, but although it has bigger stadiums it has a lot more political question-marks around it. To varying degrees, these problems are true in Panama, Colombia, Nicaragua, etc: each has some sort of thing that goes against it, sadly. And then, of course, there is Cuba, which will never happen until the embargo goes down. Other possibilities? Well, there are other big cricket places in Australia, with the most notable being the Melbourne Cricket Ground (which holds over a thousand spectators and hosted a then-record-attendance exhibition of baseball during the Olympics) and The WACA in Perth, which is smaller but is located in the closest thing Australia has to a baseball hotbed. Not far from Australia is New Zealand, where baseball is reportedly the fastest-growing team sport. Like Australia, any MLB event there would likely take place on a cricket field, such as Eden Park in Auckland or Westpac Stadium in Wellington. In Europe, a problem arises that many cities lack good baseball facilities (or, outside of Britain, cricket stadiums that can be easily turned into baseball fields temporarily), and those that do generally aren’t very big. The top facility in Germany, which is located in Regensburg, can only be expanded to 10,000 people, for example, while the biggest ballpark in Italy (in Nettuno) only holds about 8,000 maximum and the best ballpark in Spain can only hold 7,000 and hasn’t been in that large of a configuration since the 1992 Olympics. Perhaps soccer stadiums could be temporarily converted, but they’d be very tight fits. Finally, baseball is a long way from playing any sort of MLB events in Africa or the Middle East, for various reasons. That said, if such an event were to take place, it would likely be in a cricket stadium, such as those in South Africa. So, where do you think MLB will next have international games? This entry was posted in Baseball, International, MLB and tagged 2014, baseball, Baseball stadiums, best, Best of 2014, converted, cricket grounds, foreign, international, international baseball stadiums, MLB, possible MLB international games, Sports by danglickman. Bookmark the permalink.